But I have one more reason to publish a recipe for pie: I am joining the party for the first birthday of Museum 140 (and I want to win!). Lemon Meringue Pie sounds so good! And wait for it: it is an american cake! Un-be-lie-va-ble! 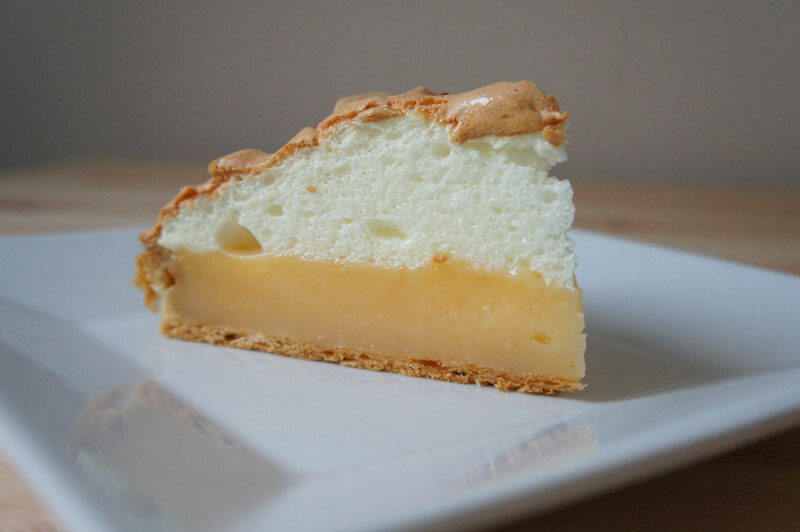 I am very picky with cakes, if you’ve been reading this blog you know that well, but this cake when done properly is amazing, simply perfect, so beautiful and so tasty, a tangy lemon cream that contrasts the sweetness of a big cloud of meringue and the texture is excellent. Lemon meringue pie is a complex recipe though. I make tart pie dough all the time, it is not hard at all (please try to make it once, you will never buy a pre-made tart pie again, ever). 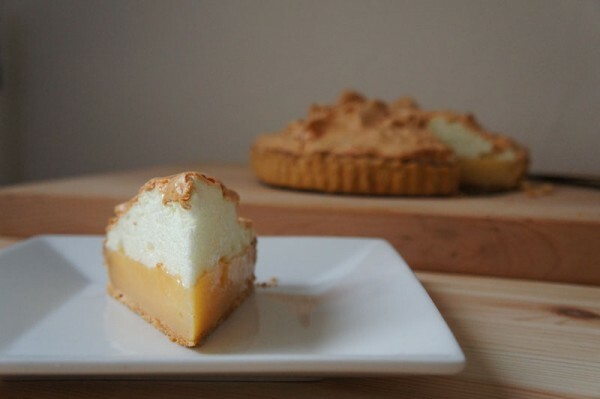 However lemon cream and meringue are easy to mess up. I found a thousand (quite literally) different recipes for the lemon filling, some with orange juice, some with water some with milk. Some with a little lemon juice and some with a ton of lemon juice. What to do, what to do?? Just like a good engineer would do, I averaged a bunch of recipes and just tried! The consistency is perfect, the cream doesn’t slide out of the cake at all and the process to make it was easy. My only complaint is that this cream is more like a lemony pastry cream, I would have liked something less thick, something more gelatinous. I was also afraid it would be too tangy but on the contrary, given the sweetness of the meringue a more tangy cream would have been better. And finally the meringue. This is my first time ever making meringue, and of course I screwed up XD I am not quite sure what went wrong, but I made my pie right before going for lunch and when I came back my pie had gotten chicken pox! The meringue collapsed a little and the sugar seems to have oozed to the surface, so it’s actually a sugary chicken pox but still :/ Also the inside of the meringue looks too “airy”, not compact/creamy enough. Nevertheless I sliced a piece and melted at the nice flavor and consistency! Do you know how to make a good meringue? Please share your experience with me. For this cake I used a loose bottom fluted tart pan of 25 cm (10″) in diameter. I had some dough left over but everything else was right, don’t halve the amount of dough because it won’t be enough. You can make something else with the leftover (my suggested recipe will be here soon). Start with the pastry dough since it needs to chill. Pour the flour in a large bowl and make a well. Add butter (in chunks slightly softened), salt, sugar and egg. Work with your fingertips until everything is amalgamated. Add the cold milk and draw everything together. Kneed quickly, make a ball, wrap in plastic and chill in the fridge for 30 minutes. Preheat the oven to 190ºC (375ºF). 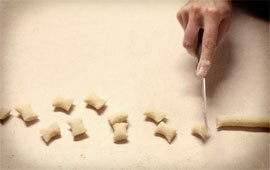 Take the dough from the fridge and roll on a floured surface until it is nicely thin 2-3 mm (1/16-1/8″). Line a slightly buttered loose bottom tart pan. Adhere the dough to the bottom and sides of the pan and then run the rolling pin along the edge of the pan to cut the eccessive dough. Finally, prick the bottom of the pie with a fork. Proceed to bake the pie blind, that is, line the dough with parchment paper, spread dry beans (or pie weights) all over the surface and bake for 25 minutes. Remove the parchment paper and beans, return to the oven and bake for 3 more minutes. Note that the beans are not edible after they have been in the oven, keep them for your next blind baking. On to the lemon cream. Mix the liquids: water, milk and lemon juice. In a bowl mix the cornstarch with 1/3 of the liquids. Pour the rest of the liquids in a saucepan (I used a 1 liter -4 cups- saucepan but the cream reached the brim so go a little larger), add sugar and butter and bring to a boil. In a clean bowl mix the egg yolks with a pinch of salt. As soon as the mixture in the saucepan reaches a boil pour it slowly into the cornstarch mixture whisking. Add the egg yolks and transfer back to the saucepan. 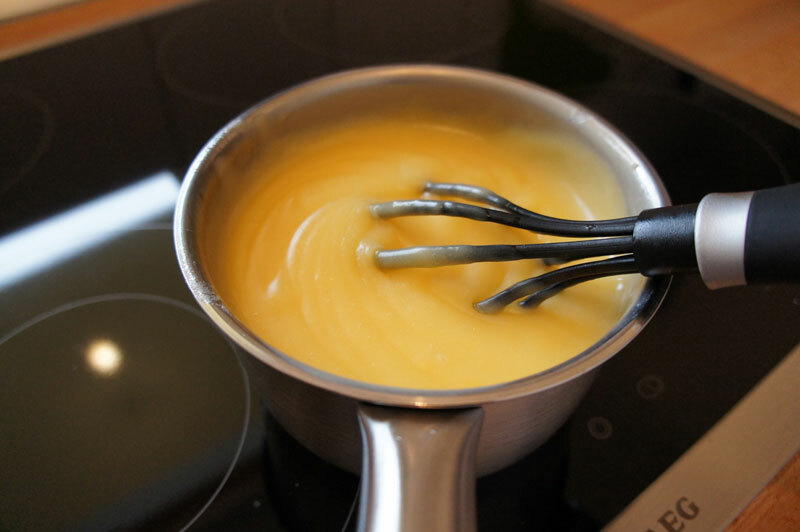 Whisking continuously, bring to a boil again and boil for a couple of minutes or until the cream becomes stiffer. And finally the meringue. 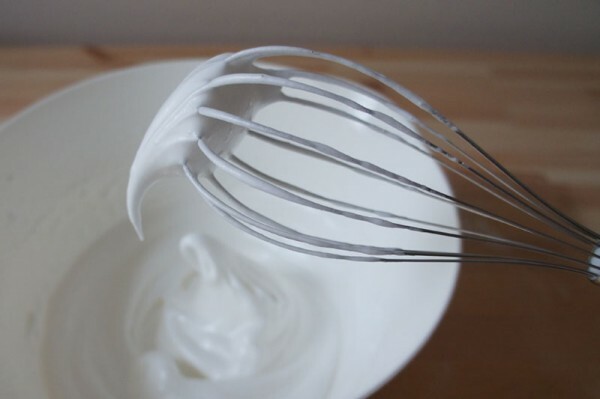 Whip the egg whites until soft peaks form, add the powdered sugar mixed with the vanilla flavored sugar a little at a time continuing to whisk. You could use few drops of vanilla flavor if you don’t find the flavored sugar, in this case flavor the egg whites directly. Continue to beat until the mixture is stiff and glossy (I may have failed at this point not whisking enough even dough it was stiff). Time to put it all together. 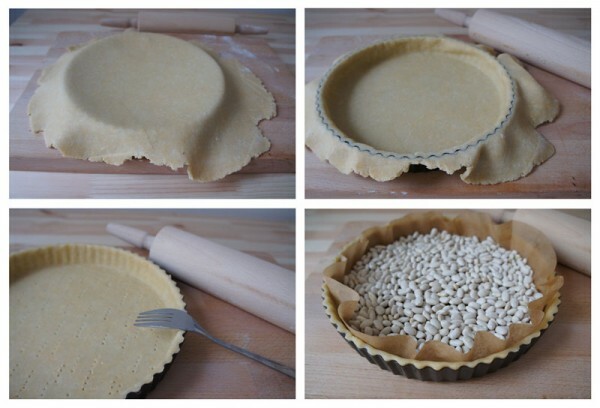 Assemble the pie: fill the pastry shell with the lemon cream and spread it evenly. Spoon the meringue on top, make sure all the pie is covered and then rough up the surface. 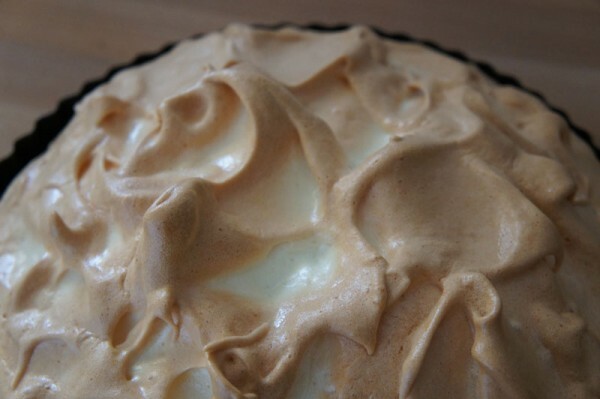 Bake for 45-50 minutes until the meringue feels crunchy to the touch. I thought 190ºC (375ºF) was too much so I baked it at 160 but it never became crunchy :/ it browned though so I took it out anyway. Meringue bakers, do you have suggestions? Let cool before slicing!! And enjoy! PS: If you think this cake looks amazing but you don’t really want to go through the hassle of making the meringue. Just whip some heavy cream sweetened with powdered sugar, make sure the lemon cream has cooled and pour dollops of whipped cream on top. Yum! I think I will make it this way next time!